Wow. Just wow. I’m still shaking my head over what happened in our house tonight. I love Indian food and often make the ‘heat-and-eat’ cans of Saag Paneer, Chana Masala, and Vegetable Korma. You know — the kind you can get in the grocery store International aisle. They’re great for nights when my husband is working late, the kids have had an easy chicken nugget night, and the only person left to feed is myself. We’ve taken the kids out for Indian food before, but it’s been a while. Honestly, I don’t think they remember it. 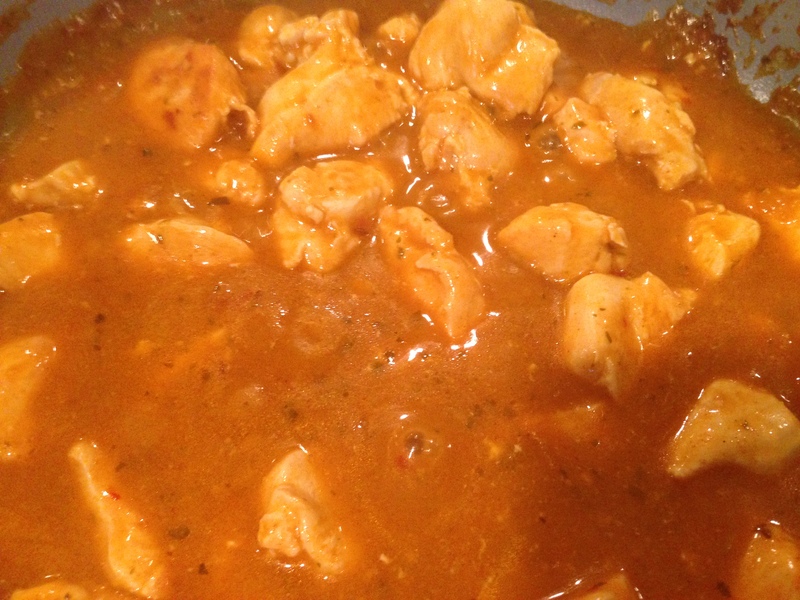 So tonight, I had a bottle of Butter Chicken simmer sauce in the pantry and decided — it’s go time! Time to try this on the kids! Heat the oil in a wok over medium-high heat. 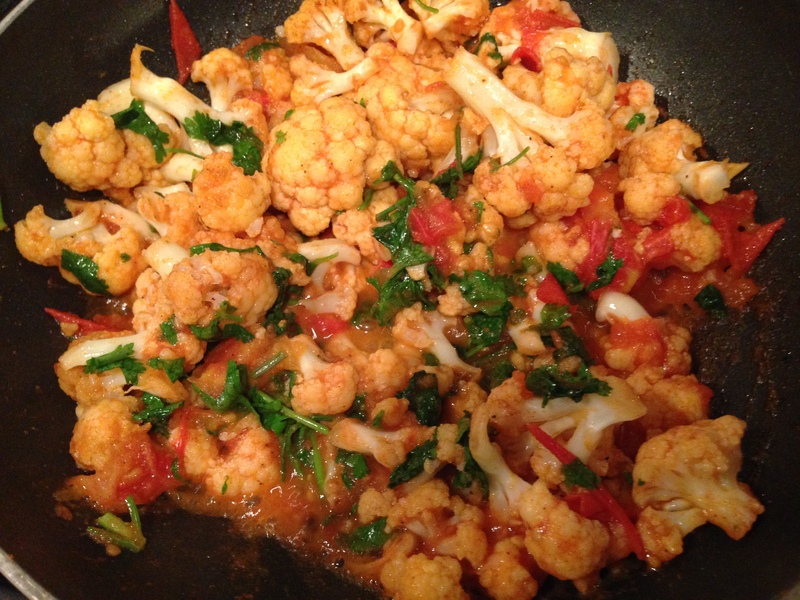 Add the cauliflower and sprinkle with cumin and garam masala. Saute. Add the diced tomatoes and cilantro. Cook through. This takes a total time of about 10 minutes. 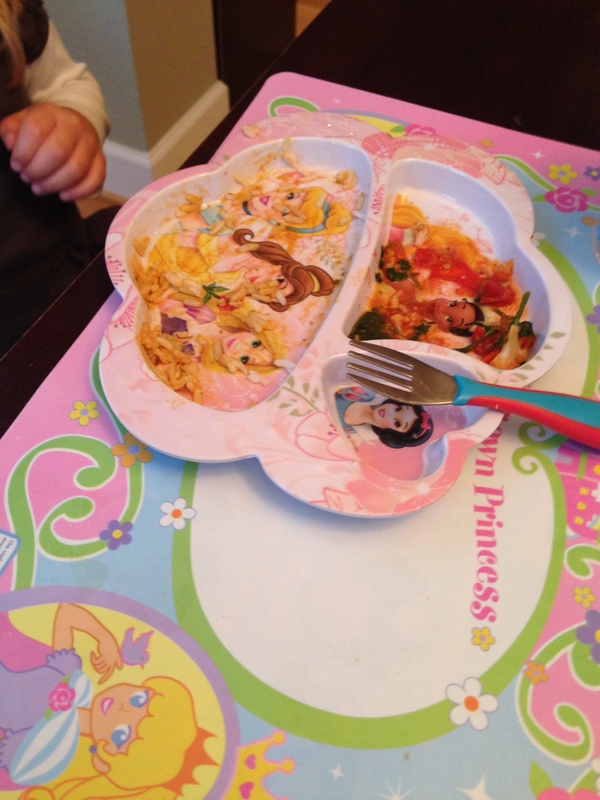 My 3-year-old CLEARED her plate!!! I had to take a picture of it to believe it myself! My 5-year-old cleaned his plate and asked for seconds!!! My 7-year-old liked the Butter Chicken and the jasmine rice (even though earlier in the night he told me he’s ‘not really a fan of Indian food.’) He really liked the cauliflower, but didn’t like the tomatoes in it. I think he had a problem with the texture of them.